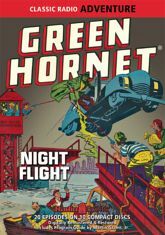 Racketeers and swindlers, thieves and killers -- they all feel the sting of The Green Hornet! World War II might be over, but there's more crime than ever in Britt Reid's corner of the world. That means action for the crusading publisher turned masked avenger -- apprehending scheming crooks, corrupt politicians, and Communist spies. Jack McCarthy wields the gas gun as the streamlined Black Beauty prowls the streets in twenty exciting 1948 adventures - many of which have not been available since their original broadcasts! Includes a Program Guide by radio historian Martin Grams, Jr.